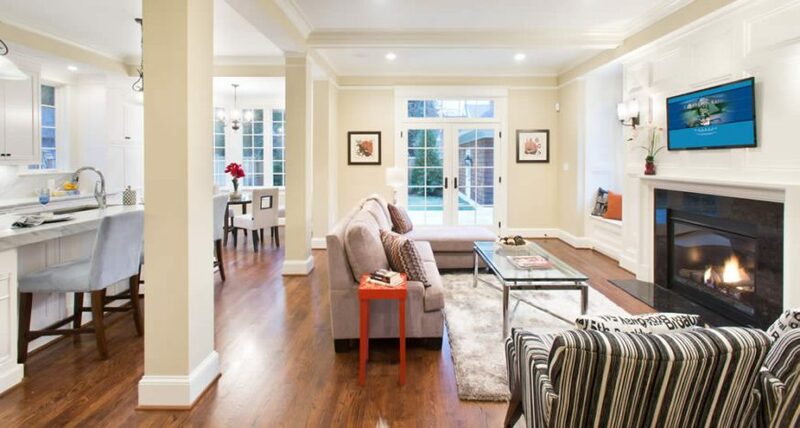 It’s such an exciting time to build or renovate a home in the Bethesda area! There are many new and unique home trends to consider. But one home feature that was introduced about 15 years ago and looks like it is here to stay is having a Great Room. A Great Room turns the family room and kitchen into one combined larger space. In other words, these rooms often combine traditional living spaces into an open area that brings the family and guests closer together during mealtime and food preparation. So let’s look at how to have a greater Great Room in your Bethesda home! Having a breakfast bar in your kitchen can serve as a divider between the kitchen and living room areas. A breakfast bar or snack bar can also be a great place to gather during meal preparation. Our customers also find that this bar serves as a handy place for paperwork, homework or computer use while dinner is being prepared. Bonus tip: A regular height breakfast bar is optimal for a standing desk too! Contact us to talk about the home design features that would be best for YOUR home! No, we don’t mean to use your Great Room for loud music and dancing – though that’s certainly an option! We are talking about further enhancing the space by having a lofted ceiling constructed. This allows the great room to have a more open feel to it than it does when built as two separate rooms with a lower ceiling. If a lofted ceiling doesn’t match your design style go with a minimum of 10′ ceilings. Nearly every home we design has 10′ ceilings on the first level and our customers just love it! The open feeling of a Great Room is further enhanced by including large windows and doors. A set of large French or sliding glass doors can really open up the space. We recommend adding generous picture windows facing your best view or southern exposure to allow natural sun and scenery to brighten up the room too. Having doors that lead to your backyard or patio from your Great Room is another way to enhance the space. Outdoor living spaces are more popular than ever, so making it easy to access them is essential. Enjoy barbecues and outdoor entertaining while maintaining easy access to your homes’ interior amenities by adding exterior doors in the Great Room. No one is better at combining today’s home construction trends with your specific needs and budget than Rasevic Construction. We’ve been building and remodeling custom homes since 1990 and have delighted many customers. We combine our landscaping and construction experience to create dream homes on the inside and out! Please contact us to help make your Great Room and living spaces everything you want and more! Just call 301-986-6900 or reach out online today!